Jesus’ exhortation to convert, The time is fulfilled, and the kingdom of God is at hand: repent, and believe in the gospel (Mk 1:15), is not directed just to those who do not yet know him, but rather to all the Christian faithful, who also need to convert and to re-enkindle their faith. “This second conversion is an uninterrupted task for the whole Church” ( CCC , 1428). Conversion starts in our heart: a conversion limited to external appearances is not true conversion. It is impossible to counteract sin, which is an offence against God, without a truly good act, an act of virtue, by which we repent of acting against God’s will and actively try to eliminate this disorder with all its consequences. This is the meaning of the virtue of penance. “Interior repentance is a radical reorientation of our whole life, a return, a conversion to God with all our heart, an end of sin, a turning away from evil, with repugnance toward the evil actions we have committed. At the same time it entails the desire and resolution to change one’s life, with hope in God’s mercy and trust in the help of his grace” (CCC,1431). In addition, Christians have many other ways to put into practice their desire for conversion. “ Scripture and the Fathers insist above all on three forms,fasting, prayer , and almsgiving (cf. Tob 12:8; Mt 6:1-18), which express conversion in relation to oneself, to God, and to others” (CCC , 1434).These three forms sum up all our efforts to rectify the disorder of sin. “Christ instituted the sacrament of Penance for all sinful members of his Church: above all for those who, since Baptism, have fallen into grave sin, and have thus lost their baptismal grace and have wounded ecclesial communion. It is to them that the sacrament of Penance offers a new possibility to convert and to recover the grace of justification” ( CCC , 1446). During his public life Jesus not only exhorted people to do penance: he welcomed sinners and reconciled them to his Father. “It was when he gave the Holy Spirit to his apostles that the risen Christ conferred on them his own divine power to forgive sins: ‘Receive the Holy Spirit. If you forgive the sins of any, they are forgiven; if you retain the sins of any, they are retained'(Jn 20:23)” ( CCC , 976). This power is transmitted to the bishops, successors of the Apostles as pastors of the Church, and to the presbyters, who are also priests of the New Testament and the bishops’ collaborators in virtue of the sacrament of Holy Orders.“Christ has willed that in her prayer and life and action his whole Church should be the sign and instrument of the forgiveness and reconciliation that he acquired for us at the price of his blood. But he entrusted the exercise of the power of absolution to the apostolic ministry” (CCC , 1442). This sacrament has a number of names depending on which aspect is being stressed. “It is called the sacrament of Penance , since it consecrates the Christian sinner’s personal and ecclesial steps of conversion, penance, and satisfaction” ( CCC , 1423). “It is called the sacrament of Reconciliation , because it imparts to the sinner the love of God who reconciles” ( CCC , 1424). It is called the sacrament of confession , since the disclosure or confession of sins to a priest is an essential element of this sacrament” (Ibid.). “It is called the sacrament of forgiveness , since by the priest’s sacramental absolution God grants the penitent pardon and peace” (Ibid.). “It is called the sacrament of conversion because it makes sacramentally present Jesus’ call to conversion” (CCC , 1423). 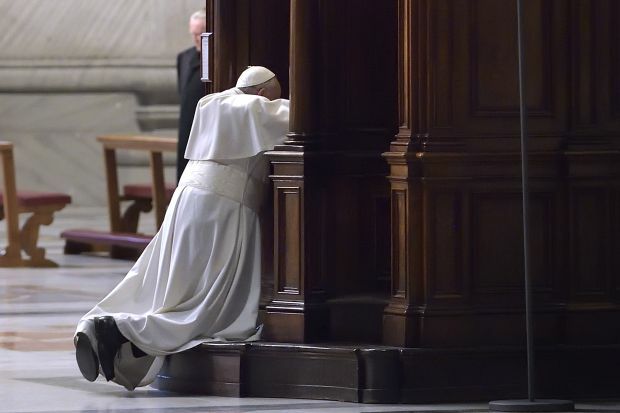 “Those who approach the sacrament of Penance obtain pardon from the mercy of God for the offence committed against Him and are at the same time reconciled with the Church, which they have wounded by their sins, and which by charity, example, and prayer seeks their conversion” ( Lumen Gentium , 11). “The essential elements are two: the acts of the penitent who comes to repentance through the action of the Holy Spirit, and the absolution of the priest who in the name of Christ grants forgiveness and determines the ways of making satisfaction” ( Compendium , 302). These are “the acts of the person who undergoes conversion through the action of the Holy Spirit: namely, contrition, confession and satisfaction” (CCC, 1448). “When it arises from a love by which God is loved above all else, contrition is called ‘perfect’ (contrition of charity). Such contrition remits venial sins; it also obtains forgiveness of mortal sins if it includes the firm resolution to have recourse to sacramental confession as soon as possible” (CCC, 1452). “The contrition called ‘imperfect’ (or ‘attrition’) is also a gift of God, a prompting of the Holy Spirit. It is born of the consideration of sin’s ugliness or the fear of eternal damnation and the other penalties threatening the sinner (contrition of fear). Such a stirring of conscience can initiate an interior process which, under the prompting of grace, will be brought to completion by sacramental absolution. By itself however, imperfect contrition cannot obtain the forgiveness of grave sins, but it disposes one to obtain forgiveness in the sacrament of Penance” (CCC, 1453). “The reception of this sacrament ought to be prepared for by an examination of conscience made in the light of the Word of God. The passages best suited to this can be found in the Ten Commandments, the moral catechesis of the Gospels and the apostolic Letters, such as the Sermon on the Mount and the apostolic teachings” (CCC, 1454). On confessing his or her sins a Christian penitent submits to the judgment of Jesus Christ, who exercises this judgment through the priest. The priest prescribes works of penance and absolves the penitent’s sins. The penitent fights sin with the weapons of humility and obedience. “Absolution takes away sin, but it does not remedy all the disorders sin has caused. Raised up from sin, the sinner must still recover his full spiritual health by doing something more to make amends for the sin: he must ‘make satisfaction for’ or ‘expiate’ his sins. This satisfaction is also called ‘penance'” (CCC, 1459). “And when he saw their faith he said, ‘Man your sins are forgiven you'” (Lk5:20). “Those who are well have no need of a physician, but those who are sick. I have not come to call the righteous, but sinners to repentance” (Lk 5:31-32). “And he said to her, ‘Your sins are forgiven'” (Lk 7:48). Ibid. The enclosed quotation is from Paul VI’s Indulgentiarum Doctrina , 1 January 1967, 4. POPE FRANCIS’ REMINDS FILIPINOS AND THE CHURCH IN THE PHILIPPINES: DAILY PERSONAL CONVERSION AND EFFORT TO FIGHT INJUSTICE AND INEQUALITY! LET’S SHAKE OFF THAT MEDIOCRITY FROM US AND AIM FOR A GREATER LOVE FOR JESUS! AIM TO BE HOLY!